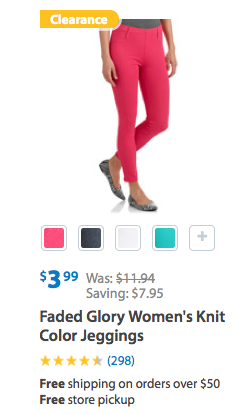 Faded Glory Women's Knit Color Jeggings On Clearance For $3.99 (Reg. $11.94)! You are here: Home / Great Deals / Faded Glory Women’s Knit Color Jeggings On Clearance For $3.99 (Reg. $11.94)! Faded Glory Women’s Knit Color Jeggings On Clearance For $3.99 (Reg. $11.94)! Wow! I just found this awesome clearance deal on these super cute jeggings! You can snag a pair of these Faded Glory Women’s Knit Color Jeggings On Clearance For Only $3.99 (Reg. $11.94)! You may even be able to select FREE store pick up if available in your area!